Grafham (near Huntingdon) is one of the powerhouses of the Sprint 15 Class. There are about 36 Sprint 15s at Grafham although quite a few are owned by fun/occasional sailors. There are usually 4 - 8 racing on a Sunday where the Sprint 15s dominate the catamaran fleet and the racing standard is very high. The fleet is very competitive and notable sailors include current National Champion, Stuart Snell, Thomas Sandal (quite often the Nationals runner up), Simon Farthing (a past magazine editor and a frequent heavyweight champion winner), Grubguru Frank Sandells (who also likes playing on his HurricaneSX), Mark & Jacob Aldridge, Steve Petts, Richard Philpott, Simon Farthing, Richard Whitelock, Trevor Arnold, Keith Ball and many more. Grafham usually field the biggest team at the National Championships and has won the team championships more times than any other club. It's members have also held the National Championship more times than any other club and 4 different Grafham sailors have been National Champion. Grafham has also hosted our largest ever non-nationals traveller event with 46 entries (19 from the home club). Club Racing takes place throughout the year on Sundays. There are 2 races back to back at 11am and 2 races back to back at 1.30pm for most of the year. In the winter months (Nov, Dec, Jan) there is just 1 race after lunch. There is also a Wednesday evening race during the Summer (April- September) and it is great fun doing the race and staying for the meal afterwards. The Club has 2 Sprint 15s which can be hired for a nominal fee and this is a great way to get going before you have decided to buy a boat. The Club runs a big Catamaran Open each year in late October and this is usually the Spint 15 Inland Championships and the last event of the Summer traveller series. 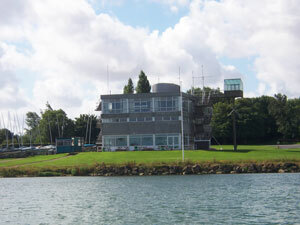 Grafham Water is 2 miles west of Buckden which is on the A1, midway between Stevenage and Stamford. It is a large man-made inland water with a maximum length of 3 miles and is 1.5 miles wide at its widest point. The water area is 1600 acres which gives ample space for all types of sailing and is particularly suitable for catamarans. The Sprint 15 fleet is the biggest in the country and are a friendly bunch who support both club events and the Sprint 15 Association traveller series. Take the A1 and then turn West at the Buckden roundabout towards Perry. Ignore the sign to Grafham and keep straight on to Perry village. In Perry take the right turn to the Club by a large Cedar tree - opposite the Wheatsheaf Pub. Camping: There is a small camping area in the Club Grounds which is free and you do not have to book. Note: caravans are not permitted, neither are dogs. It does get filled quite quickly.